With Thanksgiving and Christmas approaching, unique homemade gifts are often desired for party hosts and for friends and family. 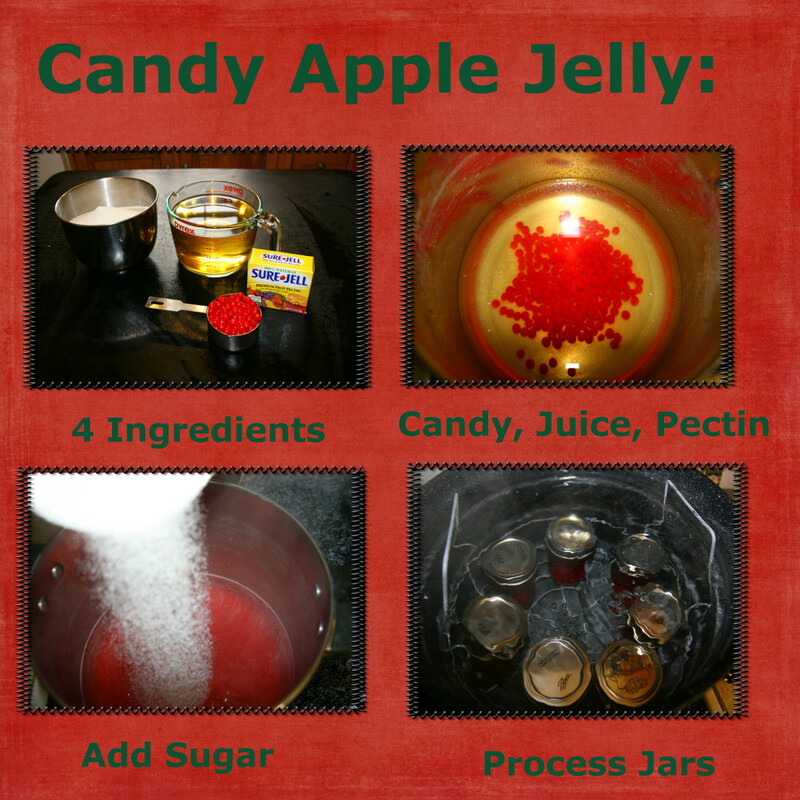 For people who love to can their own jelly and jam, Candy Apple Jelly is an excellent gift idea. If giving this jelly as a gift, be sure to buy decorative jelly jars. Ball makes beautiful jelly jars with a quilted glass design. Cut a square of fabric with a seasonal design and place the fabric at an angle over the lid - secure the fabric in place with the jar's ring. Add a cute label stating "Candy Apple Jelly" and make the jelly part of a gift basket or use as a small hostess gift. The apple jelly recipe is so easy to make, any beginning canner can make the jelly in a short period of time. This jelly fills the kitchen with an amazing cinnamon apple aroma. The jelly is brilliantly red, and tastes a lot like freshly baked apples. 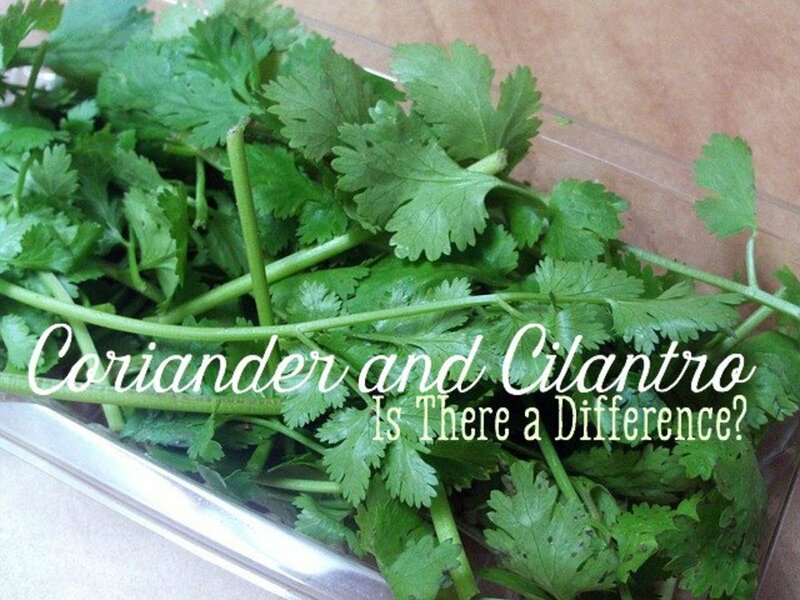 The flavor is amazing, and friends and family will be sure to want the recipe! This recipe will make approximately 6-8 jars (8oz size) of jelly. Any store brand apple juice brand will work, and some people prefer to use apple cider for this recipe. The clearest, jewel-red color will come from using apple juice. Red hots are small, red cinnamon candies that can be found on most candy aisles, or in the bulk food department. Pectin is generally kept alongside other canning supplies, and may be found at any grocery store. A large boiling water bath, canning funnel, lid lifters, lids and rings, and a jar lifter are needed to can the jelly. If the jelly is not canned, it must be refrigerated and eaten within 2 weeks. Canned jelly will keep in a pantry for up to a year. Clean the jars and rings well with hot, soapy water, and set aside. Depending on the lid manufacturer, the lids may need to be boiled or merely washed in hot, soapy water (consult the instructions on the package). 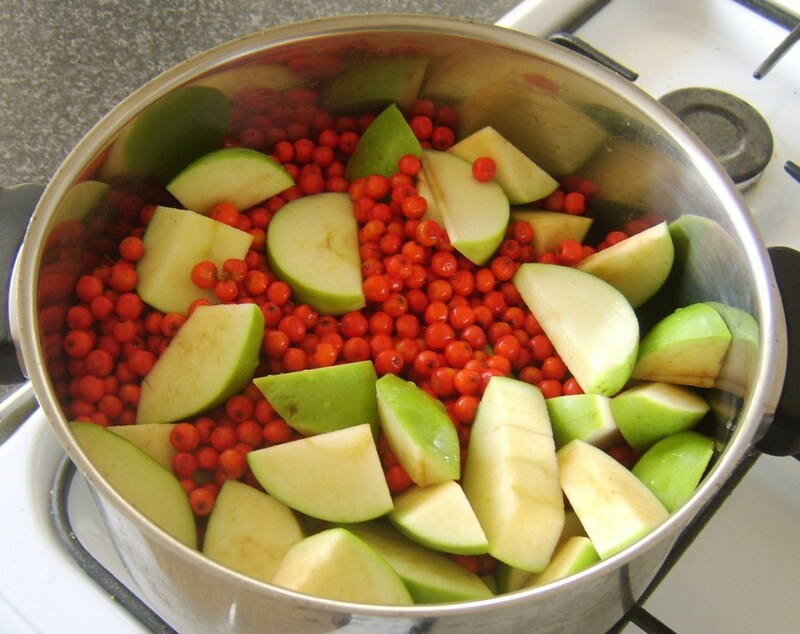 Add the apple juice, red hot candies, and pectin to a large saucepan. Stir to dissolve the pectin. Turn on the heat and bring the mixture to a boil, stirring frequently. Do not allow the candies to stick to the bottom of the pan. The candies will melt and the entire mixture will turn a brilliant red color. 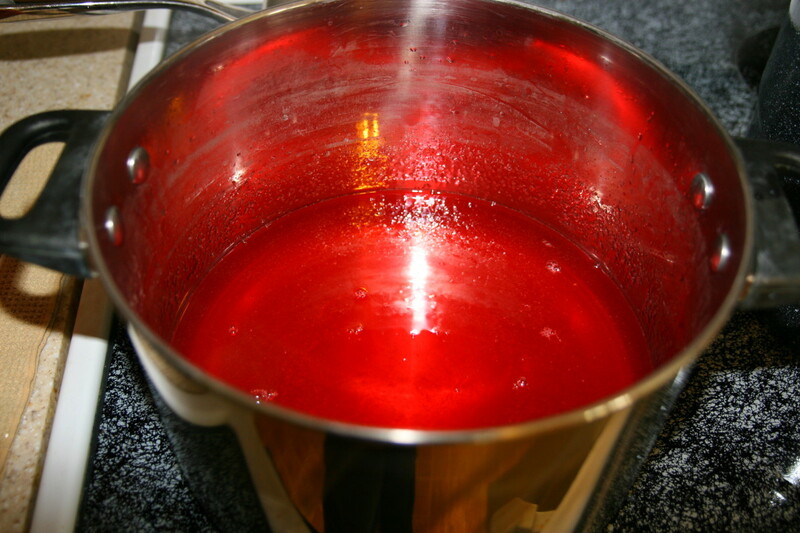 Once the jelly starts to boil, add the 4 ½ cups of sugar, stirring thoroughly to dissolve the sugar. The jelly will thicken considerably once the sugar is added. Bring the mixture back to a rolling boil, and boil for 2 minutes. Ladle off any foam or undissolved candies, and fill each prepared jar, leaving ¼” head space in each jar. Apply the lids and tighten the rings, and place the jars into the boiling water bath. Ensure that each jar is covered by 2” of boiling water, and process for 10 minutes. Remove the jars from the hot water bath with the jar lifter and set on the counter to cool. Each lid should “ping,” or seal with a popping sound after a period of time. Check the jars by pressing on the center of each lid: a sealed jar will not flex, and will remain depressed. Unsealed jars will flex up and down: these must be refrigerated and used within 2 weeks. The Ball Canning Discovery kit is excellent for beginning canners, as it allows anyone to use a basic stock pot to can basic recipes. The kit is inexpensive, which helps to allow a beginner to try canning without investing a lot of money in canning equipment. 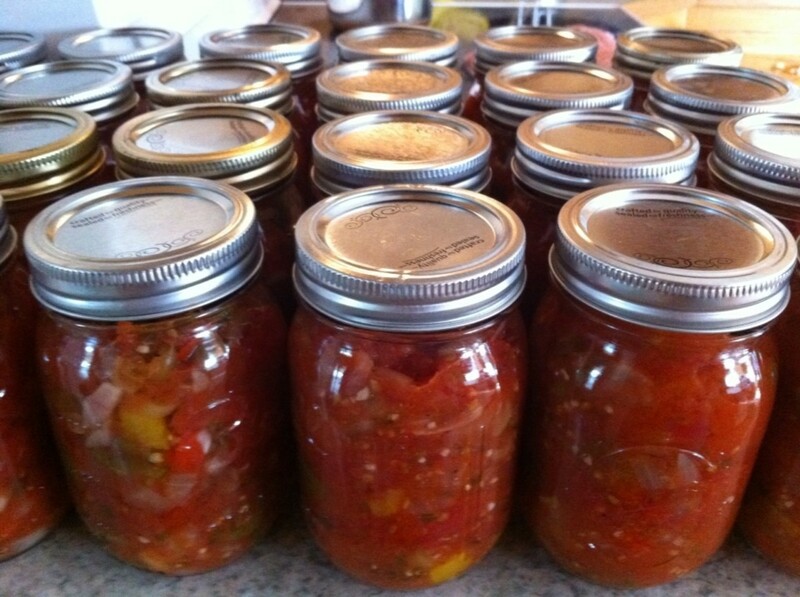 Canning may seem intimidating to some, but it is really a simple process. 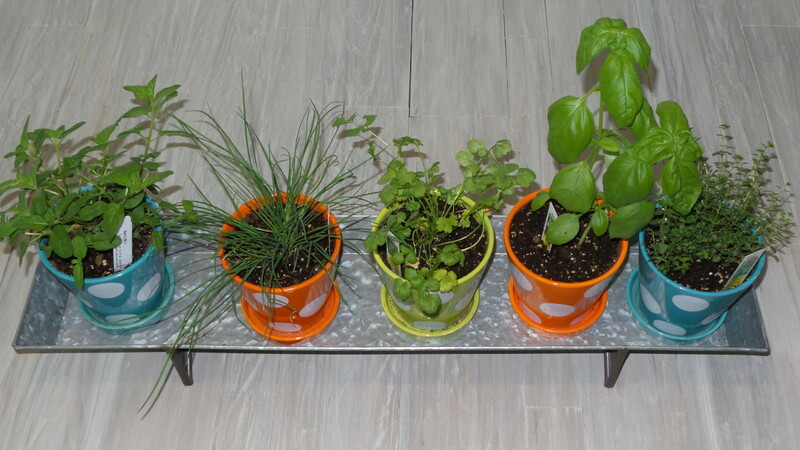 Anyone who has a vegetable garden or who likes to make homemade gifts should give it a try. I prefer the Ball jars and canning lids, though nearly any brand will work sufficiently well. Do not try to use the old fashioned wire and glass jars with the rubber seals: these often do not seal well, and the risk of botulism or other food poisoning makes these vintage jars unsuitable for modern canning. Current canning jars use glass jars and reusable rims, but the lids must be purchased new for each canning job to ensure a tight seal. Fortunately, the lids are very cheap! Ball makes a “Canning Discovery Kit” which allows would-be canners to experiment with canning, and the Candy Apple Jelly is a fun and easy jelly to make with this kit. The kit comes with three mason jars, a basket to use in any large stock pot: this allows people to experiment with canning without investing in large amounts of money in canning equipment. Can you seal apple jelly with paraffin? Sealing jelly with paraffin wax is no longer recommended as the seal is nearly impossible to guarantee and may become disturbed over time, allowing mold and other pathogens to grow in the jelly. 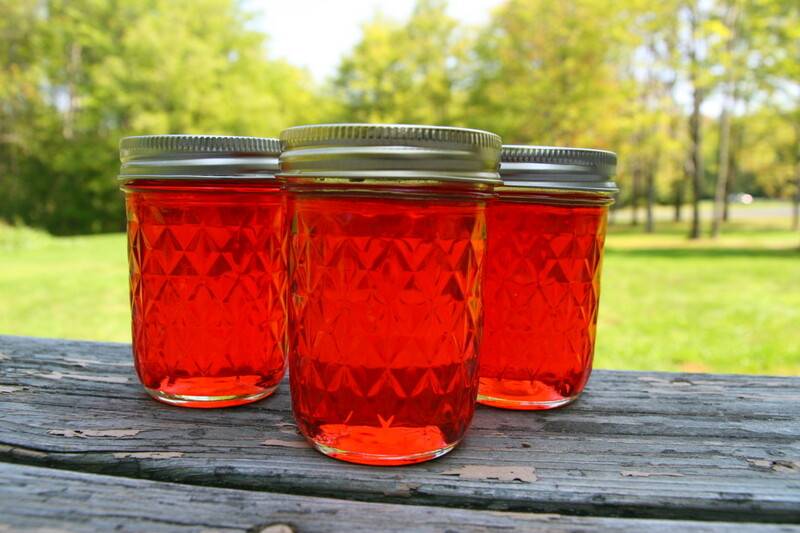 The preferred method for canning jelly is hot water bath canning as it forms a vacuum seal over canned goods. I would try one pouch, Pat, but if it is too thin then I would use 2 the next time around. One pouch should do the trick, since apple juice has pectin in it, which helps the jelling process. for jams and jelly how would that work out and if I use one package or 1 pouch in the liquid there is 2 pouches ?? This is one of the first recipes I ever canned. 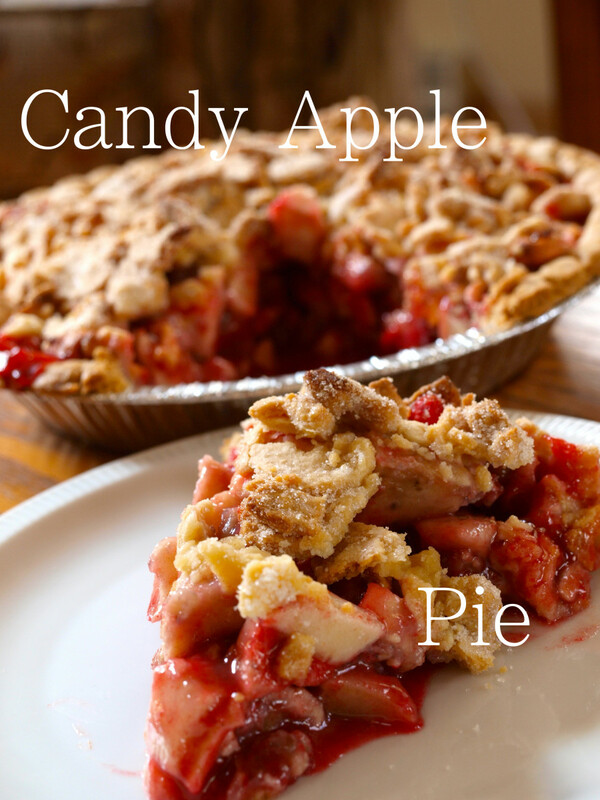 I loved it because it was simple to make and I could make it with a couple of ingredients from the store. It also made a great homemade Christmas gift! It sounds like a success (even if it didn't gel with the low sugar content), Sheryl! I never thought about using it on ice cream - that would be delicious! Thanks for updating, Sherylswanson! I am so glad it worked - I have a feeling the "low-sugar" pectin would work better for the jelly if you halve the sugar content. I have some on-hand (I make my fruit jelly with less sugar to make it a bit healthier). Sometimes it will thicken a little over time, too! The cinnamon hard candies melted perfectly. I could not bear that much sugar so i cut the sugar in half. Taste is great but it should be a bit thicker. I will definitely do this again using the cinnamon hard candies (they are easy to get all the time) but I will up the pectin a little to compensate for less sugar. Thanks!! It might work, Sherylswanson0426 - I haven't tried it with hard candy, only with the red-hots. The idea is the same, though! I'm not sure if the hard cinnamon candy would melt as easily as the red-hots. If you try it, let me know how it works out! Any guess if this will work with cinnamon hard candies rather than red hots? I never crush mine with a rolling pin - just add the red-hot candies to the apple juice and slowly bring the juice to a boil. If the candies are not melting, try reducing the heat and letting the mixture cook a bit longer (sometimes bringing the juice to a boil too rapidly won't give the candies sufficient time to melt). I hope this helps! I've tried two batches and my candies did not totally melt. It seemed like the outside of the candies melted but not all of it. I even crushed them with a rolling pin before adding and they still didn't melt away. Is this normal? Hi Cassie - use the 1.75 oz. package. I use Sure Jell, which is the type that most of my friends use. I have used Ball's brand of pectin, too, but it came in a jar and I had to measure it out with a teaspoon. I really like the Sure Jell because it comes in the 1.75 oz. packet, and you can just dump the whole thing in! If you use Splenda, you will need to purchase the pectin labeled for "No Sugar" recipes (in the pink box if you use Sure Jell). Sugar is needed to set the jelly, but the "no sugar" pectins will work just fine with Splenda. Be aware that making a jelly with the no sugar pectin will result in runnier jelly - it is totally possible to do, but the "set" might not be as good as jelly made with sugar. I am totally new to canning but you made this look super easy. My grandma used to make cinnamon apple jelly when I was a kid and I have not been able to find it anywhere until now. My question (sorry if it's a dumb one) is how much pectin is in the package you're using? I was checking amazon and I see a 1.75 oz, a 1 oz, and a 2 oz box. Is a certain brand better than another? Also for canning purposes can splenda be substituted for the sugar? Thanks, Melanie! I hope your friends and family like the gift! Thanks so much. Great recipe!!!!! Hi Melanie! This jelly is a tad "runny" and it will move a little if the jar is tilted. The jelly should be fine as long as the jar lid seal is tight. If you have a jar to spare, you could try opening one to see if the jelly is set enough - I made a batch about six weeks ago and it is looser than strawberry jam, but is still definitely jelly (it shouldn't be liquid). I noticed my jelly was on the loose side, but it was fine on toast or in PB&J sandwiches. It is very pretty! I love the taste of this jelly and the color is beautiful! The only worry I have is that I canned this 2 days ago and when I pick up the jar and turn it sideways the jelly moves, is that normal? I know the jars are sealed properly, so will the jelly be good? I plan on giving them as christmas gifts. Thanks for the very easy and recipe. It is really tasty - my older son loves the jelly. I only make it in the fall, so he looks forward to it all year long! I hope you enjoy it! NOM NOM! I'm keeping this for my recipe box - the kids are gonna love it. Thanks for sharing! Definitely not healthy, but it is fun and tasty! It is also really easy to make! What is this? Candy Apple Jelly, you say... I have to try this, seriously. Grrrreat hub! I should clarify that you can add 1 1/3 packages of pectin on a second attempt at the jelly if the first one doesn't work out... you can't really add pectin to a finished jelly recipe (for obvious reasons)! I hope your jelly is gelling well! It is usually runnier when it is hot, and it should thicken as it sits and cools. If it is still runny after sitting, you can try adding a little more pectin (about 1/3 of a package on top of the first package). I've made this one a few times and never had a problem with it, but more pectin will solve a "runny jelly" problem if you are having issues with it! I hope that helps! Hi Shari, the jelly takes about a day to completely firm up. It will be a little on the "loose" side if used before it has completely set. You can also do a "gel test" by spooning off some of the boiling jelly and putting it on a cold plate - if it gels up nicely, then it is ready to go. does this set up immediately or does it take a day? It is a fun fall canning project - it is a fun thing to give away as a homemade gift, or to bring to Thanksgiving dinner to spread on toast! Sounds good! I may have to give this a try. It is very easy! This would be a great first canning project! It sounds wonderful and looks so easy. Oh, I bet using the red-hots with chopped apples would taste great over ham! We used to have a pork recipe that used apple cider - it was delicious. 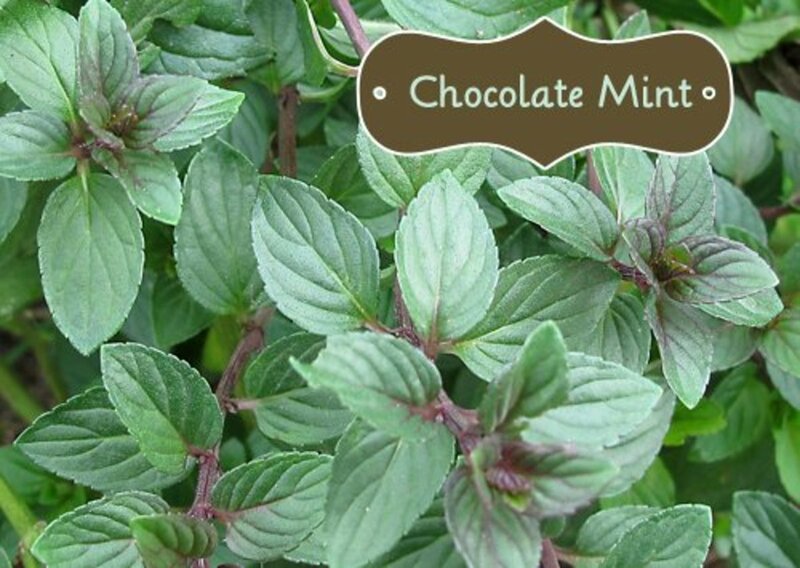 I need to find it again (we used to cook it a lot when we lived in Ireland, because it was one recipe that we could find all the ingredients for there)! The candy apple jelly is pretty fun to make, and it does taste good over toast! I like this idea. I had used similar ingredients with chopped apples, which is great served over ham and other meats, but this jelly looks really fun and versatile. I have actually thought of trying a recipe with apple juice and caramel jelly beans... it may work! The color would be a dull brown, however... so it might not look as appetizing! I've never heard of a jelly apple. I don't really like apples but I love caramel, so I would pick the caramel apple. It makes the apple easier to eat. I wasn't sure where to find red-hots, but they were actually in the bulk foods aisle (where the candy is stored in large tubs). Yum. This sounds absolutley delicious. If I can't get Red Hots candy, can I substitutre with something else, or do you need that for the cinnamon flavour? It is pretty simple! You can always modify the recipe to eliminate the candy, too (we generally try to avoid too many artificial dyes with the kids, but this was a fun one to make)! Strawberry jam is really easy to make, too (just strawberries, sugar, and a box of pectin)! Oh my gosh, this looks like such a fun jelly to make! Perhaps this can be a sort of "gateway recipe" for me- to get me easing into the process before moving on to more advanced jelly and jam recipes. This is definitely NOT a "healthy" jelly - I usually make regular strawberry jam from real fruit (they sell no-sugar pectin that really helps with sugarless fruit jams). It is fun to make, though, and does make a great gift. I like it on toast and the boys thought it was really fun. They had it in their peanut butter and jelly sandwich the other day and loved it - I usually use strawberry jam, though! I always have a hard time giving up the jelly I can... both the boys eat a ton of peanut butter and jelly sandwiches, so we go through a ton of it! leann2800, I was really surprised by how well the candies melted. Just be sure to stir or else they will stick to the bottom of the pan as they melt! Handicapped Chef and sagebrush mama, this recipe is really easy (as long as you stir while the candies are melting)! My kids are really excited to eat it - I had some on toast earlier.. delicious! Hyphenbird, I was going to make it for gifts, too. It is so pretty and it really does taste great! This looks like a great project for my teenagers! Working on some canning just now, as I read! Nice Nice Nice I'm going to have to try this sounds good and tasty.......plus its super simple. This looks so simple. I have never thought of using candy in the jelly. That's cool. Thanks! It is really simple - the candies melt pretty quickly and you don't need to crush any fruit (like you do with strawberry jam). 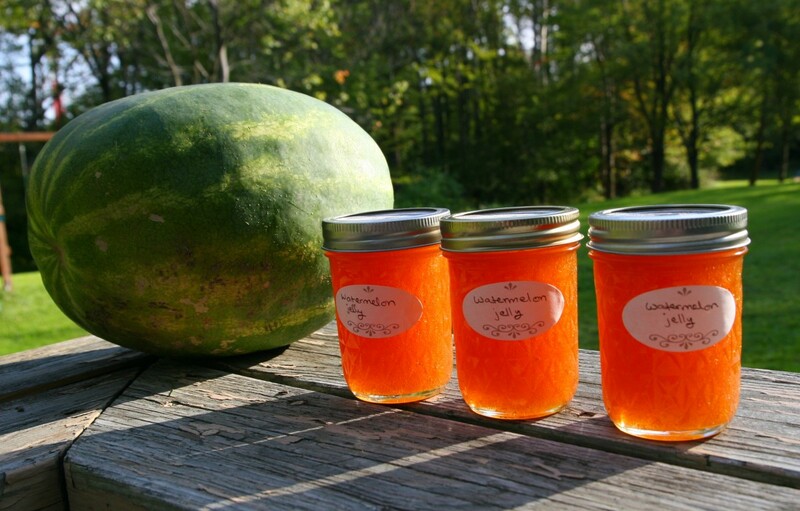 The apple jelly tastes great on a bagel or English Muffin! Sounds so yummy and easy! I will try it out ! It is the perfect homemade jelly gift - it really does taste wonderful. I made some today and have half a jar of "extra" in the fridge - it is excellent on toast! It is a really fun and easy canning recipe - and the jelly is so pretty from this recipe! I made some today. 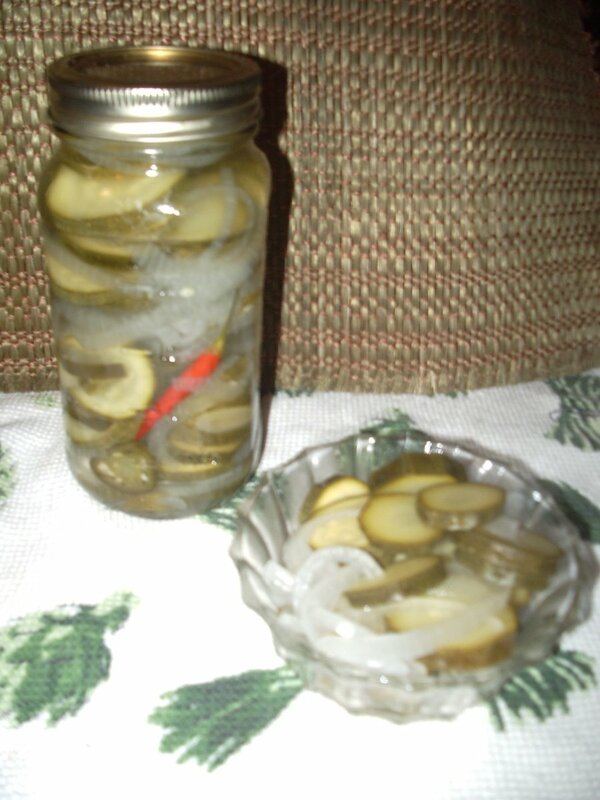 I had some friends introduce me to canning, and I love it. One warning, though: it can be addictive!